You have no doubt overheard someone at work or at a party telling his friends that he never wears a seat belt—and that he has some really good reasons. The story usually goes something like this: He heard from a buddy he knows that a friend of a friend who was not wearing a seat belt had a bad car accident and walked away from it because he was thrown clear of the car. This is one of the most pervasive car safety myths out there. And if you believe this myth, you could be setting yourself up for serious injury or death. 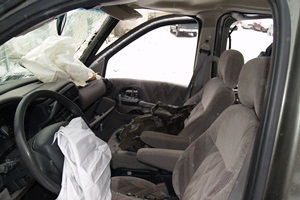 Although there are a small handful of cases in which someone has survived a car accident after being thrown from the car, this is a very rare occurrence. In fact, you actually have a 25 percent greater chance of being killed if thrown from the car. Just consider the physics of the situation. The force applied to your body when a collision occurs can be strong enough to propel you 150 feet, which is equivalent to about 15 car lengths. And you would not just be flying gracefully through the air either. First, your body may go crashing through the windshield, it may scrape along the rough asphalt for yards, and then you could end up getting crushed by your own car or someone else’s. This is not to mention the other objects you may be hurled into when flung from the car. Statistics from a study performed by researchers at James Madison University show that the proper use of a seat belt reduces serious injuries from traffic accidents by 50 percent and fatalities by 60 to 70 percent. It’s a simple thing that can protect your health and save your life—wear seat belts. Another common myth is that bracing for impact causes more damage to your body, and that it’s best to remain relaxed. Of course, actually having the ability to choose one way or another about bracing has a lot to do with how much time you have before impact. Many accidents occur in the blink of an eye, so suggesting that someone should “stay relaxed” has really limited practical value. However, the most current science indicates that if you have time, bracing for impact will likely reduce the amount of injury, particularly to tendons and ligaments. One of the most common types of injury from an auto accident is whiplash, which occurs in about a third of all collisions. If you see a car approaching in your rear view mirror that you believe is going to collide with yours, the best thing to do is to press your body against the seatback, with your head pressed firmly against the head rest. This way you are less likely to suffer injuries to the ligaments in your neck, as your head will not be slammed back against the head rest, then flung forward. Auto accidents are never pleasant, but by knowing the facts about auto safety you can help reduce your chances of sustaining a serious injury. If you do end up in an accident, it’s always a good idea to get a medical evaluation promptly, even if you think you haven’t suffered any significant injuries. Many auto injuries take time for their symptoms to become apparent or significant enough for victims to recognize how badly they may have been hurt. By the time the symptoms are obvious, the victim and his or her doctor may have lost a valuable opportunity to treat the underlying injuries. Please call or visit the office if you or someone in your family has recently been involved in an auto accident.